A Week in Mexico - Integral Steps, an integrative education non-profit supporting the balanced development of individuals, families and communities, through music, movement, psychotherapy, ecology and creative arts! Colorado and Portland based! Spend a week at camp with others who share your love for music making. 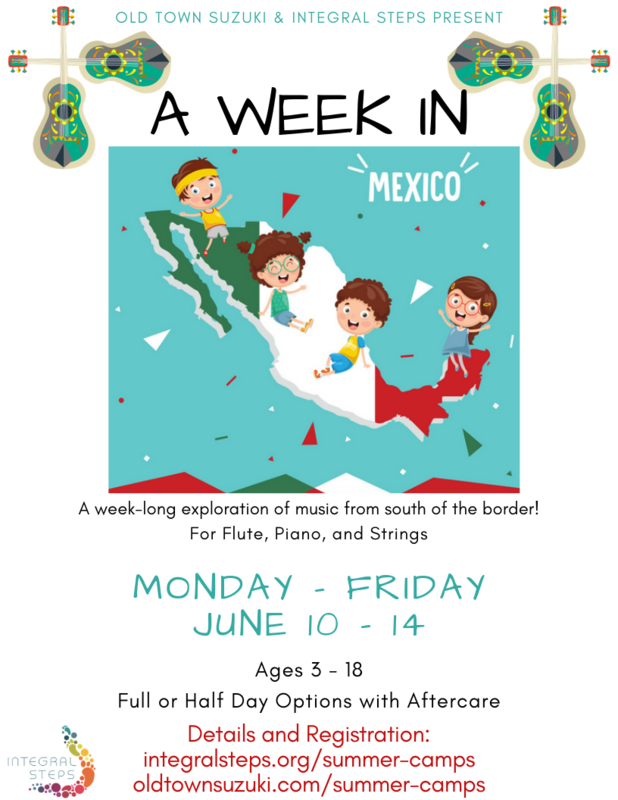 Along with the Suzuki repertoire, we will explore the music styles of Mexico! Camp mornings include daily group/enrichment class, master class, art class and snack with fun games. Bring your own lunch and stay for daily lunchtime activities. In the afternoon, campers join together to play in small orchestra or ensemble. Camp ends on Friday at 12:30pm with an outdoor performance at Memory Square (weather permitting) for friends and family. Details are subject to change. Tuition ​includes instruction, morning snack, and camp t-shirt. ​All students must have their own instrument for the whole week of camp. There are limited numbers of rental instruments available at a rate of $10/week or $20/month. Please tell us about your current instrument situation on the registration form.